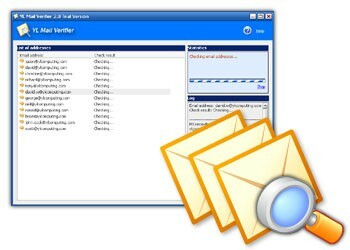 E-mail Address Verifier 2.0 is office suites & tools software developed by YL E-mail Address Verifier Software. E-mail Address Verifier is a program that verifies the validity of e-mail addresses in mailing lists. This E-mail Address Checker program works on the same algorithm as ISP mail systems do. Mail servers addresses for specified address are extracted from DNS. The program tries to connect with found SMTP-servers and simulates the sending of message. This program is shareware, which means you can download and use E-mail Address Verifier 2.0 for free during 30-days trial period. After this period you gonna have to buy E-mail Address Verifier 2.0 software for $38.95 or uninstall the program. E-mail Address Verifier 2.0 supports different languages (including English). It works with Windows 98/XP/Vista. We have tested E-mail Address Verifier 2.0 for spyware and adware modules. The software is absolutely safe to install. Our website has thoroughly tested business product E-mail Address Verifier 2.0, written the review and uploaded installation file (2162K) to our fast server. Downloading E-mail Address Verifier 2.0 will take minute if you use fast ADSL connection.